Synthetic peptide conjugated to KLH derived from within residues 750 to the C-terminus of Human beta Catenin. ab16051 gave a positive result in the following whole cell lysates: Hela, A431 ab16051 gave a positive result in the following tissue lysates: Mouse Brain Mouse Testis Mouse Spinal Cord Mouse Ovary Rat Brain ab16051 gave a positive result in the following FFPE tissue; Human colon adenocarcinoma, human liver normal. Our Abpromise guarantee covers the use of ab16051 in the following tested applications. IHC-P Use a concentration of 0.5 - 1 µg/ml. Perform heat mediated antigen retrieval with citrate buffer pH 6 before commencing with IHC staining protocol. Sandwich ELISA Use a concentration of 0.1 µg/ml. For sandwich ELISA, use this antibody as Detection at 0.1 µg/ml with Mouse monoclonal [BDI080] to beta Catenin (ab19448) as Capture. WB Use a concentration of 0.25 µg/ml. Detects a band of approximately 95 kDa (predicted molecular weight: 94 kDa). Lanes 1 - 3: Merged signal (red and green). Green - ab16051 observed at 95 kDa. Red - loading control, ab9484, observed at 37 kDa. 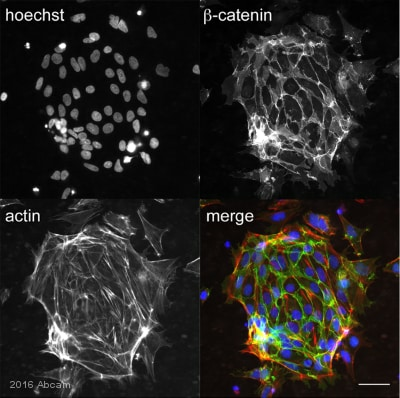 ab16051 was shown to specifically react with CTNNB1 (β-catenin) along with additional cross-reactive bands in wild-type HAP1 cells. No band was observed in knockout samples. Wild-type and CTNNB1 (β-catenin) knockout samples were subjected to SDS-PAGE. Ab16051 and ab9484 (Mouse anti GAPDH loading control) were incubated overnight at 4°C at 0.25 ug/ml and 1/20000 dilution respectively. Blots were developed with Goat anti-Rabbit IgG H&L (IRDye® 800CW) preabsorbed ab216773 and Goat anti-Mouse IgG H&L (IRDye® 680RD) preabsorbed ab216776 secondary antibodies at 1/20000 dilution for 1 hour at room temperature before imaging. 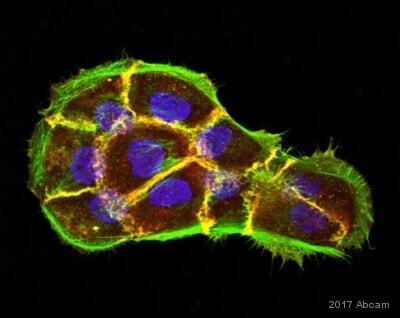 ab16051 staining CTNNB1 (β-catenin) in HeLa cells. 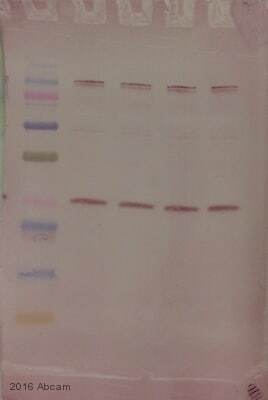 The cells were fixed with 100% methanol (5min) and then blocked in 1% BSA/10% normal goat serum/0.3M glycine in 0.1%PBS-Tween for 1h. 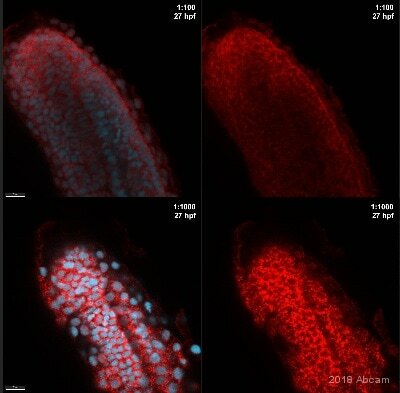 The cells were then incubated with ab16051 at 1μg/ml and ab7291 (staining Tubulin) at 1µg/ml overnight at +4°C, followed by a further incubation at room temperature for 1h with an AlexaFluor®488 Goat anti-Rabbit secondary (ab150077) at 2 μg/ml (shown in green) and AlexaFluor®594 Goat anti-Mouse secondary (ab150120) at 2 μg/ml (shown in pseudo color red). Nuclear DNA was labelled in blue with DAPI. 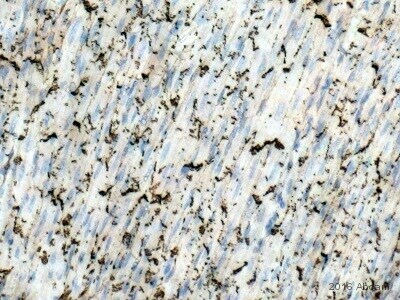 IHC image of beta catenin staining in a formalin fixed, paraffin embedded normal human liver tissue section*, performed on a Leica Bond™ system using the standard protocol F. The section was pre-treated using heat mediated antigen retrieval with sodium citrate buffer (pH6, epitope retrieval solution 1) for 20 mins. The section was then incubated with ab16051, 0.5 µg/ml, for 15 mins at room temperature and detected using an HRP conjugated compact polymer system. DAB was used as the chromogen. The section was then counterstained with haematoxylin and mounted with DPX. 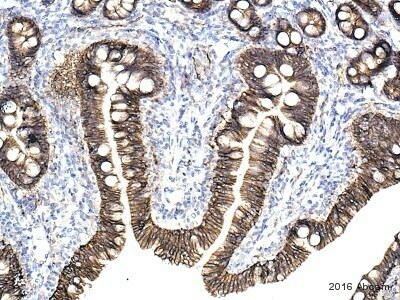 IHC image of beta catenon staining in a formalin fixed, paraffin embedded human colon adenocarcinamo tissue section*, performed on a Leica Bond™ system using the standard protocol F. The section was pre-treated using heat mediated antigen retrieval with sodium citrate buffer (pH6, epitope retrieval solution 1) for 20 mins. The section was then incubated with ab16051, 0.5 µg/ml, for 15 mins at room temperature and detected using an HRP conjugated compact polymer system. DAB was used as the chromogen. The section was then counterstained with haematoxylin and mounted with DPX. Immunohistochemistry (Formalin/PFA-fixed paraffin-embedded sections) - Anti-beta Catenin antibody (ab16051)This image is courtesy of an Abreview by Carl Hobbs. ab16051 staining beta Catenin in rat brain tissue sections by Immunohistochemistry (IHC-P - formaldehyde-fixed, paraffin-embedded sections). Tissue was fixed with formaldehyde and blocked with 2% BSA for 10 minutes at 21°C; antigen retrieval was by heat mediation in a citrate buffer. Samples were incubated with primary antibody (1/1000 in TBS/BSA/azide) for 2 hours at 21°C. A Biotin-conjugated goat anti-rabbit IgG polyclonal (1/300) was used as the secondary antibody. A second band of 75 kDa was also detected in Hela whole cell lysates and A431 lysates. This smaller band was of equal intensity to the 94 kDa band in the A431 lysates (data not shown). Standard Curve for Beta-Catenin (Analyte: beta Catenin protein (Tagged) (ab63175)); dilution range 1pg/ml to 1ug/ml using Capture Antibody Mouse monoclonal [BDI080] to beta Catenin (ab19448) at 1ug/ml and Detector Antibody Rabbit polyclonal to beta Catenin (ab16051) at 0.1ug/ml. 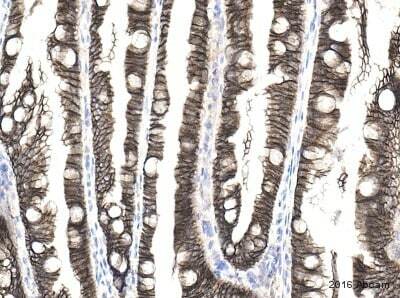 ab16051 staining beta Catenin in developing gut tissue sections from mouse by Immunohistochemistry (IHC-P - formaldehyde-fixed, paraffin-embedded sections). Tissue was fixed with formaldehyde and blocked with 2% BSA for 2 minutes at 21°C; antigen retrieval was by heat mediation in a citrate buffer. Samples were incubated with primary antibody (1/2000 in TBS/BSA/azide) for 2 hours at 21°C. A Biotin-conjugated goat anti-rabbit IgG polyclonal (1/300) was used as the secondary antibody. ab16051 staining β-catenin in SW480 cells treated with XAV939 (ab120897), by ICC/IF. Increase of ß-catenin cytoplasmic expression and decrease in nuclear expression correlates with increased concentration of XAV939, as described in literature. The cells were incubated at 37°C for 6 hours in media containing different concentrations of ab120897 (XAV939) in DMSO, fixed with 4% formaldehyde for 10 minutes at room temperature and blocked with PBS containing 10% goat serum, 0.3 M glycine, 1% BSA and 0.1% tween for 2h at room temperature. Staining of the treated cells with ab16051 (1 µg/ml) was performed overnight at 4°C in PBS containing 1% BSA and 0.1% tween. 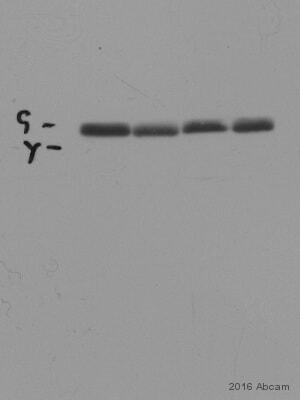 A DyLight 488 anti-rabbit polyclonal antibody (ab96899) at 1/250 dilution was used as the secondary antibody. Nuclei were counterstained with DAPI and are shown in blue. 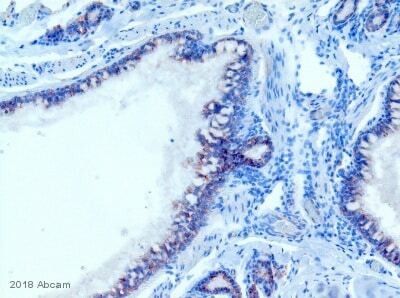 ab16051 staining human fibrosarcoma cells by ICC/IF. Cells were PFA fixed and permeabilized in Triton X-100 prior to incubation with the primary antibody (at 10µg/ml) for 1 hour at 27°C. 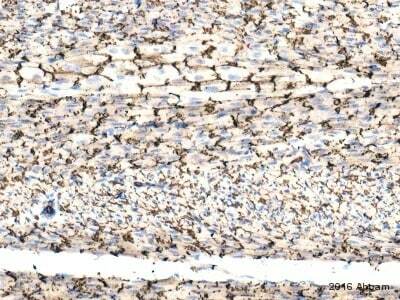 A Texas Red® conjugated donkey anti-rabbit antibody was used as the secondary. ab16051 staining beta Catenin in rat hypothalamus tissue section by Immunohistochemistry (PFA perfusion fixed frozen sections). Tissue samples were fixed with 4% PFA and later postfixed overnight in the same fixative. They were cryoprotected in 30% sucrose and cut using a cryostat. The sample was incubated with primary antibody (1/100) for 18 hours at 200C in PBS + 0.3 % Triton X100. An Alexa Fluor®488-conjugated Goat polyclonal to rabbit IgG was used as secondary antibody at 1/1000 dilution. Publishing research using ab16051? Please let us know so that we can cite the reference in this datasheet.